The space was already abuzz with excitement and chatter as I enter the beautiful open atrium. The Vice President of External Affairs for the Cleveland Leadership Center, Michael Bennett, pointed to me the fourth-floor telling where the competition was being held. I saw a few people I knew, as I walked to the elevators unsure of how this night was going to go. When I got off, on the fourth floor of the Global Center for Health Innovation, I peered down to where I arrived, scanned the room and paused to look at the architectural details of this beautiful building. A volunteer asking me which pitch category did I come to see. I told her none in particular but was there just to see how this all worked. She told me there were five categories and each contestant had 5 minutes to clearly present their ideas to the judges. I have recently learned about pitch competitions happening around the city of Cleveland and have become intrigued by the process. I started scaling up my business last year and did not even know that these things existed for small businesses. A pitch competition is when a startup or a scaling up business gives a short description of their business plan in front of an audience to a group of judges. The “elevator” pitch usually includes details of the business, industry trends or lack thereof, financial information and how the prize money will be used to help their business. Judges ask all sorts of questions after the 4- 5-minute presentation and a winner is selected. The Cleveland Leadership Center sponsored Accelerate 2018: Citizens Make Change pitch competition sponsored by Citizens Bank on Wednesday, February 21st. At this competition there would be prizes awarded to four finalists and one winner, The runners-up from each category would receive $2,000 and the winner would win $5,000! Just to tell people what your business is and how it can impact the city? Wow! Of the 77 applicants that applied, only 25 were selected. Business owners had to make sure that their business fit within the parameters of the section they applied in ordered to have their pitch reviewed. Each one of these individuals had to pitch their idea again after winning their section but this time in front of several hundred people who would then text their winning choice to a special number. Audience members could only vote once per device. The business idea with the most texts would win the grand prize. It was my first time watching a pitch competition but to me, this event was very well organized. The Cleveland Leadership Center had over one hundred volunteers, judges, and host committee members making sure that guests and contestants were at ease and could easily find where they needed to go. After the pitches, there was a reception with music performed by the drummers from Mama Fasi, a 2017 Accelerate participant. I stopped in to see several pitches. I was fascinated by the number of African American women pitching their business ideas! From apps that promote Cleveland, to breasting feeding advocacy to foster care programs, to resources for single mothers and more! I was proud to be in a room with other entrepreneurs thriving in their business ideas. 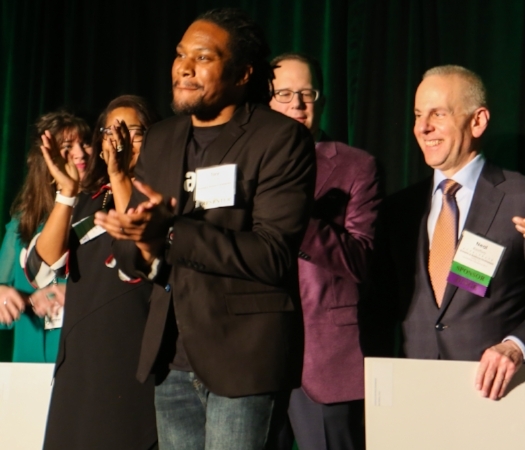 This year Tory Coats won the grand prize with his pitch for Youth Pop-Up Shops that encourage and educate young people on entrepreneurship in the Greater Cleveland area. Dare 2 Believe Young Entrepreneur Pop-Up Shops use practical techniques to prepare tomorrow’s business leaders today. Mr Coats gives them experience selling the products they produce and make. His pitch was in presented the Economic and Workforce Development category. Keshia Johnson Chambers pitched her business This is BLK CLE in the Community Change category. Her focus was on using an application to highlighted African American resources, services, landmarks, and more in Cleveland. This was in partnership with Oswald Companies and Westfield Insurance Foundation. Christopher Scott pitched his business Speak for Me in the Educating for Tomorrow category. He created a database and application of affordable public speakers. This was in partnership with Nordson. Gina VanCant and Kendra Valton pitched their idea Latch & Learn in the Health & Wellness category. Their plan is to promote breastfeeding in the African American community to decrease the infant mortality rate and family engagement through incentives and practical resources. Presented in partnership with the Cleveland Clinic. Angela Bair pitched her plan for expanding her Special Needs Resource Library in the Quality of Life category. She spoke of the need for adaptive toys and other resources for children with special needs to help them thrive within their capabilities. Presented in partnership with Cuyahoga Community College and Thompson Hine LLP. Each of the ideas I saw pitched were well thought out and executed. This only made me more determined to take my business, to the stage. Look out Cleveland, here I come! Dawn Rivers is a Founding Blogger of Black Girl in the CLE and the Founder of Daybreak Yoga and Yogis of Color Collective.